Students, faculty, and staff from 30 colleges and universities came to Williams April 9 to share their experiences of and delve into issues related to being a first-generation college student. 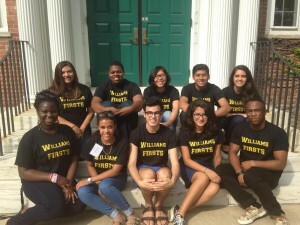 The theme of the fourth annual First Generation College Student Summit was cultivating institutional change. Events scheduled throughout the day included a presentation about creating a network of resources across colleges and universities as well as a Williams alumni panel called “Transforming the Academy.” Some of the sessions were cross-listed with the Bolin Legacy Celebration, taking place on campus April 8-9. Reyes and Veila Alejandra Moran ’17, a biology and psychology double major who plans to attend medical school, worked together to plan this year’s summit. Last year, when it was held at Wellesley College, the two co-presented with Olivier Joseph ’17 about Williams’ pre-orientation program for first-gen students. “We discussed the positive impact this orientation has and explained how it provides an easier transition into college,” Moran says. Read more about the first-gen summit.